Flies over open country, shorelines, roads; rarely forests. The head is bare and red. The wings are all black. Black Vulture (Coragyps atratus) has a gray head and silvery tips on its wings. It is a rare visitor to Minnesota. Turkey vultures soaring on the winds above the Cannon River Wilderness Area near Faribault, MN. 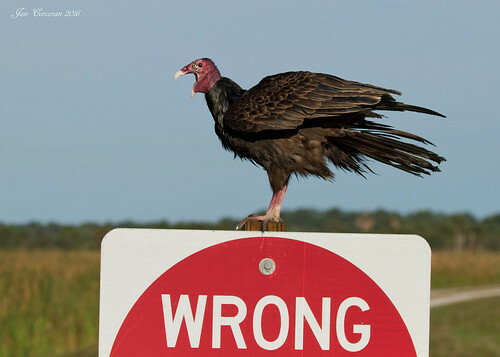 CMNH Wildlife Specialist Michelle Leighty shares some fun facts about the humble turkey vulture. QUEST visits the Lindsay Wildlife Museum and talks to an expert about Turkey Vultures. Residents are sick of their new neighbors, hundreds of black turkey vultures who have invaded their neighborhood. 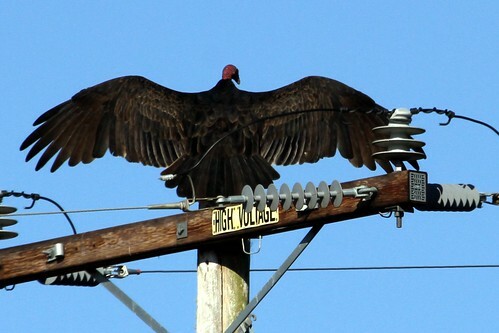 On today's CapeCast: We salute the "Bird of Death," the turkey vulture and find out what they're up to on Cape Cod. The Turkey Vulture's head, like its namesake, is bald and red. 25 to 32 inches long, with a wingspan around 6 feet. Healthy adult Turkey Vultures weigh approximately 6 pounds. 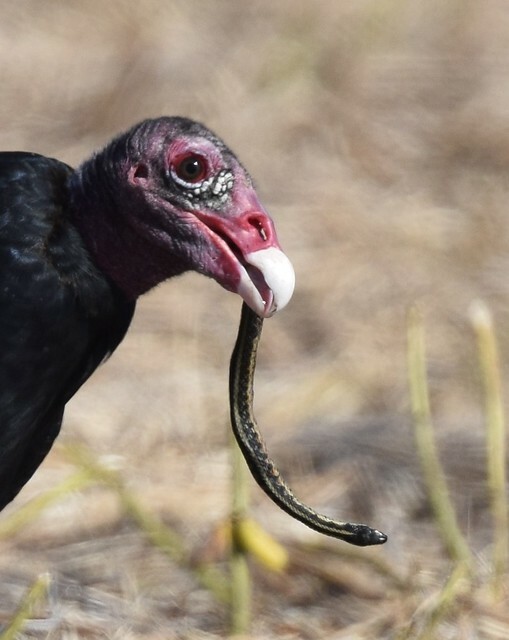 Vultures are large, carrion-eating birds. For years, it was believed that all vultures were raptors, members of the order Falconiformes. In 1994, however, it was discovered that the vultures inhabiting the American continents share a common ancestor with storks and ibises. Now, American vultures, or New World vultures, are recognized as Ciconiiformes, in the family Cathartidae. 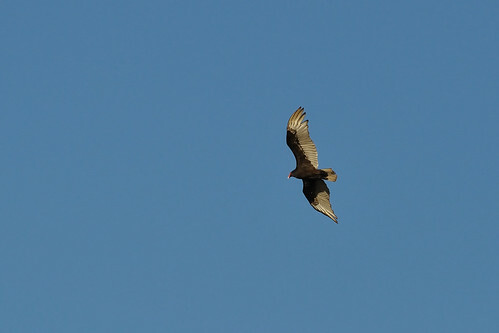 I stopped at the Corner Store and saw about 40-50 turkey vultures traveling toward me from the north. It was very windy, and many simply soared above me in no apparent hurry. I was able to video some of it on my mobile phone. I was outside at about 8:30 AM and something huge caught my eye circling slowly overhead, just above the tree tops. It was a turkey vulture! It flew slowly and gracefully, looking at the ground the entire time. I feared it was looking for my chipmunk, Chippie, but thankfully saw Chippie later in the day, safe and sound. Pipestone has a around a dozen birds that hang around the railroad tracks at the south side of town. We’ve seen them around here for at least the last ten years. Returned to roosting trees today at about 5:15 pm. Carney and Moreland! One spotted very low in the afternoon in the swamp areas near Walton park. Eleven very large birds riding thermals this afternoon over Willow St. in Faribault near the river. This evening the vultures returned to their roosting tree. The first 8 roosted this evening. They began to land around 7:30 PM. As of now, there are 34 vultures. They are split between two trees. It landed on a birch tree in my yard and spread its wings. When it did, my dog barked and scared it away. Pair sitting on our barn with wings spread. Flock of about 20 vultures flying over the town at dusk. A large number (at least 40) nest in the trees near our home. Fly out in the morning and return between 5:30 and 6:30 pm. They are here Spring into Fall. The general pattern is to fly east in the morning and return evenings.